A Bookish Mess: COYER Summer Vacation! I came across this the other day and it looked really interesting! You can click the image above to sign up as well! → COYER Summer Vacation will run all summer, June 18th – September 2nd! → On September 4th we will announce the winners of THREE $10 Gift cards for Amazon or Barnes & Noble. → There will be several opportunities for other prizes throughout the event with our social media games. 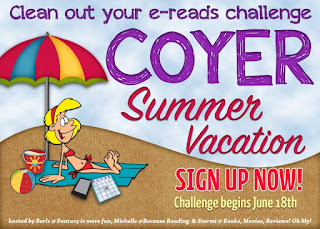 → You must create a sign-up post anytime between now and August 1st – on blog, goodreads, fb, google+, etc.Yes, that means you can sign up until August 1st! But don’t wait, you’ll miss most of the fun! → You must link to the sign-up post below (don’t link to your blog, link to the sign-up post). → You must review books somewhere & link the reviews to the review linky to be eligible for one of the grand prize giveaways. → Can I read a book that cost $10? Yes! → Are Tour books and Author Review books ok? Yes! Yes! → Can I read a paperback? An audio book? An eBook? Yes! Yes! Yes! Getting the idea? There really are very few rules here. We won’t even have a rafflecopter, to keep things as easy as possible. Instead we’ll be using random.org with the sign-up and review linky (each entry on a linky will be worth 1 entry). So if you’ve added your link there, you’re in the giveaway. I do not have the EXACT reading list that I am going to be doing - but I am going to work my way through this and make it as I go! I also plan to participate in all challenges and anything else thrown my way during this! I look forward to all the fun times ahead! Want to sign up? Just click the image at the top of the page! Join in on all the summer fun! Work your way through that TBR list!